The Red Ginger Bungalow at Halaulani Place is privately located in the back of the main house on one of the most historical and well kept neighborhoods on the Big Island. It features manicured lawns and lush mature landscaping with 9 homes on the National Register of Historic Places. Enjoy the ambiance of old Hawaii in a quiet and cool location near Pukihae Stream on this dead end street located less than a mile from downtown Hilo. Your Hosts Steve & Rose are a culturally diverse family of Hawaiian, Filipino, Okinawan, German and Portuguese heritage with roots in North Kohala. They spent more than 20 years in the Seattle area before moving back to the islands and have traveled throughout the US, Canada, Philippines, China and Central America. They have two children attending college in Boston and Wisconsin. Red Ginger Bungalow is located less than a mile from Hilo Bay and has an Ocean View form the back yard. Available on the street in front of the house. Signal fair to week in the bungalow. Stronger near the main house. Lovely old neighbourhood with a very pleasant 10 minute walk into central Hilo. The accommodation is a bit old but comfortable and has everything one needs. Wifi can be patchy, but is manageable. The hosts are lovely and helpful, and the basket of fresh fruit was a great welcome. A quaint old cottage in a tropical setting with a peek a boo ocean view. Owners Steve & Rose are warm & accomodating and live on property. Looking for a Hawaiian experience including resident geckos & coqui frog nightly serenede, this is a place you may enjoy. When we arrived in Hawaii the owner notified us a plumbing issue with the unit and would not be able to stay there. However, they were able to secure another location and cover the difference in cost. things worked out well because of there actions. Thanks! 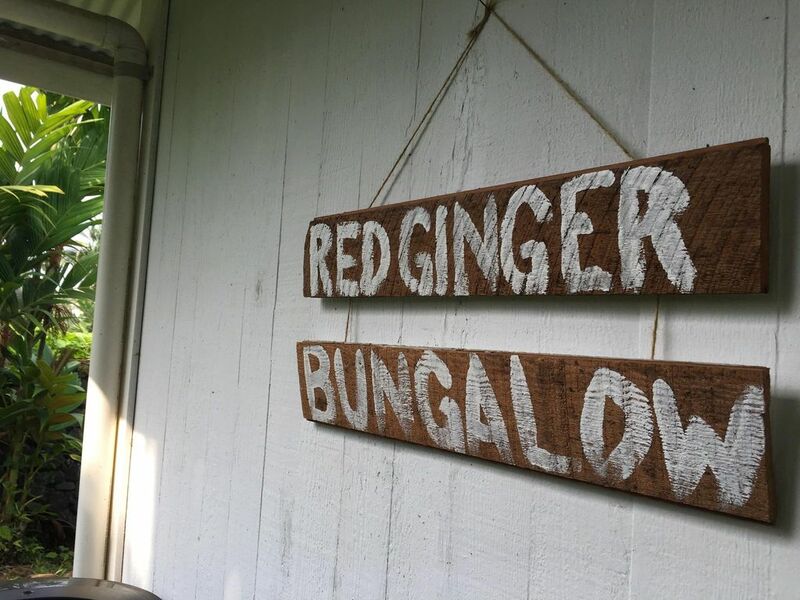 Red Ginger Bungalow has a convenient location, very clean, had everything we needed. Steve and Rose are great hosts and very helpful, kind, and accommodating. Many things were supplied we did not expect like body wash, shampoo, and coffee. Very quiet neighborhood. My husband and I loved the place. The red ginger bungalow is in an old well established neighborhood not far fom downtown Hilo. You are able to see the water in the distance from the sitting area. But if you want fancy this property is not for you. The owner lives on the property and very helpful if you have questions. The home is old but well maintained. This property is Quant and comfortable we loved it. We would stay there again. This is an historic neighborhood and property. This means old and the last year of earthquakes from the volcano and two hurricanes has not been kind to this property or to Hilo in general. That said the location is great and has a lot of charm. Also the owners are generous and kind. All in all we enjoyed our stay but do not expect a sterile, modern place. Go to Hilo and help these authentic wonderful people recover from a tough year. *Check in Time is 3:00 pm. Please email rgblodging@gmail.com or call/text 808-756-7438 to let us know your approximate time of arrival. You will find the key on the kitchen table upon arrival. *Check Out time is 11:00 am. If you would like to check out later, feel free to check with us about this possibility. Check out instructions will be available upon your arrival. *Fruits and Flowers;Feel free to enjoy any of the fruits and flowers on the property. *There is a washer and dryer available to do laundry. *There is WiFi available on the property. *This is a quiet neighborhood. Please keep the noise down after 10:00 pm. *No Pets/Animals allowed. *No smoking allowed in the vacation rental. No illegal drugs are permitted.